The emphasis given in this column over the past several months to the need for the approval and funding of the “Gateway Tunnel Project” has been echoed by leaders in both major political parties as well as by the leading Boards and Agencies governing the major infrastructure projects proposed for this entire New York- New Jersey Metropolitan Area. Rockland County, as a major suburb of New York City, in addition to gaining from the general enhancements which will accrue to ALL parts of the Greater New York-New Jersey Metro Area when this long-awaited Tunnel Project is completed, will be eligible for finally reaping the benefits of that “One-Seat Ride” right into a brand-new updated Penn Station. This would, without doubt, add great value to the County Of Rockland, including the real estate values of all homes and businesses here. 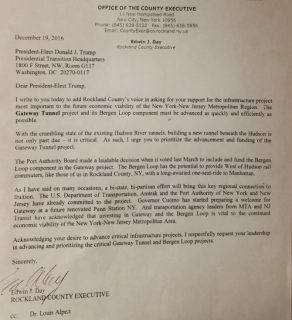 For all of these important reasons this Ombudsman strongly believed that our County HAD to reach out to our incoming President, Donald J. Trump, and join the other strong voices, including US Senator Chuck Schumer as well as the bi-partisan group of New Jersey State Senators and many others, in urging the President-Elect to prioritize this critical Gateway Project. This Ombudsman will continue to follow the progress of this vital Gateway Tunnel Project and keep all of our readers informed of all developments.